After thoroughly reviewing 8 of the best stove top griddles available today, we think the Vremi 20 inch Cast Iron Griddle is the best option available. Cast iron griddles are the workhorses of the kitchen. They’re heavy-duty and versatile in the number of foods they can cook. The Vremi 20-inch cast iron griddle for kitchen stovetop is no different. You can cook everything from pancakes to eggs, breakfast meats, and even hamburgers. 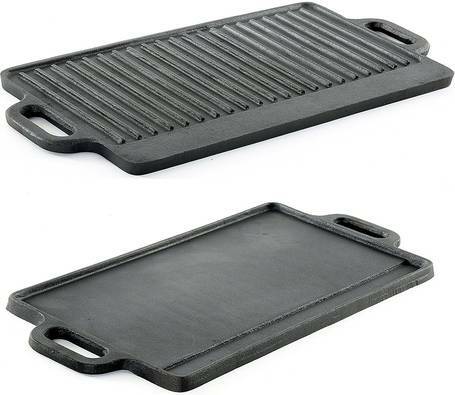 But even though this griddle is mainly used for the stovetop, it can also be used on the grill and even over a campfire. And because it has no plastic handles, I found it can go in the oven as well. The Vremi is meant to be used on two burners, either gas or electric. While a gas stove is preferred, it also works well over an electric stove. This Vremi griddle is also slightly sloped so that any fat drippings run down into a groove. This makes for healthier meat and an easier clean-up. It’s also reversible, meaning you cook things like pancakes on one side, and meats on the other. This will please any vegetarians in your house because the pancakes aren’t cooked on the same surface as the meats. This Vremi cast iron griddle also comes pre-seasoned and is advertised as ready to cook right away. But the pre-seasoning isn’t that great so it is better to season it yourself before cooking your first meal on it. Luckily, this is pretty easy. I just rubbed some oil on it, heated it up, then let it cool down. While this isn’t a huge deal, just be prepared for this extra step before cooking on it. When washing the griddle, don’t use soap because you’ll ruin the seasoning. I found using hot water and gently scrubbing was more than enough to keep it clean. In fact, one of the best features of this griddle (aside from great cooking) is how easy it is to clean up after cooking. However, there are a few downsides to this stove top griddle that are worth considering. I found it to be very heavy. Don’t store it high up in your kitchen because it’ll be hard to get out and put away every time you use it. The heavy weight can make it awkward to move around. Be especially careful when it’s hot and use a good pair of oven mitts. This griddle gets very hot, to say the least. Also, carefully consider the size. This is a 20-inch griddle and may not fit well on all stovetops. Luckily, it’s not a problem for me, but I can see how this can be a problem for others. Family moments are precious and have to have a good time with my wife and kids is one of my favorite holiday moment. Well, as usual, I love to prepare some food for my kids. The Whirlpool 4396096RB griddle has all the best and convenient features for those who love to cook just like me. You can use it on different cooking surfaces like the electric cooker stove burners just to name a few. Why I would recommend one to buy this griddle stove top. Convenience: The whirlpool griddle is made of a broad and flat surface where one can be able to prepare a variety of foods at the same time. For example, i can make my kids favorite breakfast that is pancakes, some bacons, eggs and also barbecued sausages. Durable: It is quite challenging to find a griddle that is long lasting especially when used on various stovetops but with Whirlpool you don't have to worry about its durability. The material used to craft it is sturdy and durable making it a long lasting family cooking device. Reliable: A significant benefit that I find in this device is the fact that you can efficiently regulate the cooking temperatures of your food. To make this possible, use your two burner cooker. My family loves to have the vegetables with a crunchy taste, and the same goes for eggs. We don't like to have our eggs thoroughly cooked. To achieve this, you have to have your griddle at low temperatures. This elegantly designed two burner griddle is great for host large dinner parties or family get togethers. The large griddle space gives you plenty of room to saute vegetables, sear scallops and so much more. Ideal for family breakfasts, you can make a ton of pancakes or french toast all in one batch. 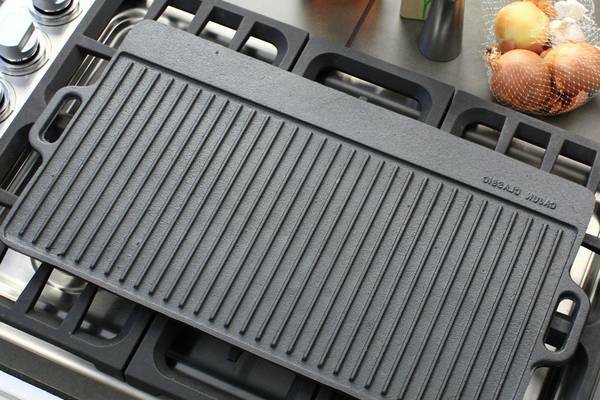 Go from the stove top to the table with the Cuisinart Griddle. Simply lift it by the cool touch handles and set it down on a hot plate. It is functional as both a stove top griddle and serving tray. No need to dirty extra serving plates during the process. The handles are made of stainless steel and are always cool to the touch. Some griddles don't come with handles and you have to let them cool before cleaning up. That's not the case with this Cuisinart stovetop griddle. Lift it by the cool touch handles and rinse it off in the sink or you can load it in the dishwasher for effortless, easy clean up. Most people use the griddle on the stove top but you can also use this griddle in the oven to broil those choice cuts of steak or fish fillets. It also serves as a food warmer. If you won't be eating right away you can keep the griddle in the oven, up to 450 degrees, to keep your food hot and fresh. It's also ideal for searing meats and vegetables as well as making omelettes, hamburgers and more! The non-stick surface will provide evenly cooked food and allows for your foods to be heated throughout. Make some homemade hot sandwiches or patty melts or spice it up and grill the perfect quesadilla. No matter what you decide to make; everything will come off with ease on this triple layered non-stick griddle surface. Some people complain that they have no where to store such an odd shaped stove top griddle, but this sleek griddle looks great sitting out on top of the stove, ready and waiting for your next meal time cooking or you can store it in the large area under the oven. You don't have to clear a big space in your cabinets and it will be ready for the next cooking session. Everyone will benefit from having this exceptionally crafted, quality griddle in their kitchen. Non-stick cooking makes cooking so much easier and you won't t have to worry about stuck on or burnt on foods. Even burnt on cheese comes right off under warm water, with virtually no scrubbing. Some types of non-stick cookware are not always dishwasher safe and can cause damage to the cooking surface, but the Cuisinart Griddle was designed with that in mind and can take years of everyday cooking without looking old and worn out. This will for sure become your go to griddle. You may even want to buy two, to cover your entire stove top. This will allow you the ease and functionality of a real restaurant style kitchen, without the commercial restaurant kitchen price. Regardless of the occasion, or the time of day, Griddles have become resourceful, global cookware, that provides cooking at ease for any occasion you wish. However, with the emergence of electric griddles and a plethora of single and double burners on the market, how can you find the right one and what you should look for in a stove top griddle? Well, there isn’t a one size fits all with regards to stovetop griddles, but this review will help you find a quality and durable griddle that will achieve the results you want most during cooking. If you are investing your money into a person or product, you should know a little about them and what makes them special to gain your trust and business. In the case of Emeril Lagasse, his resume speaks for itself. Not only is he a massive TV personality with over 2000 cooking shows, he’s also a critically acclaimed and successful chef/proprietor of 12 restaurants. When you buy from a company, you want experience, and experience is something Emeril has with the Emeril Griddle. The Emeril Anodized Double Burner Griddle, is exactly what it says it is. It makes life much easier for cooking and cleaning. Set it up for an even distribution of heat and cooking as it made for two burners. With a triple layer coating, it’s also a non-stick, which makes life simpler when you clean up afterwards, and if you are feeling a bit lazy, this Emeril Griddle has you covered as it is dishwasher safe. With the hard anodized aluminum, this griddle allows you to cook over a stovetop or in the oven safely up to 450 degrees. You don’t have to worry about harmful material, as this griddle is made PTFE free to keep your family’s health in good standing. Emeril’s Double Burner Griddle has both boxes checked for safety and convenience, but what about security? Check that one off too, Emeril’s griddle comes with a lifetime warranty on manufacturer defects. Two Handles: Customers enjoy the two handles on the side which makes for easy handling. The stainless riveted steel of the handle provides for a smooth and simple operation during and after cooking. 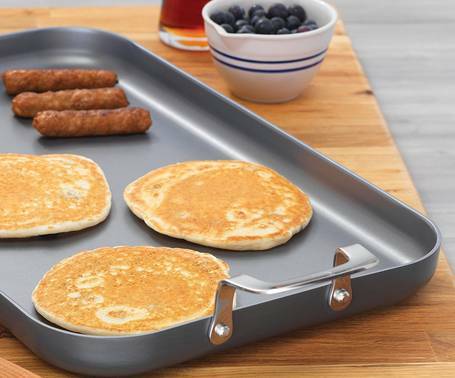 Perimeter and Pour Spouts: As noted, the non-stick and dishwasher safe features make it a hassle-free experience, but the griddle also has a friendly perimeter rim that catches grease easily, while the corner two pour spouts make it simple for you to release the collection of grease. The Size and Shape: It’s loved for its large size, which means that it’ll fit your burners, but also handle the cooking duties of an entire breakfast, lunch or dinner. You can fry up your vegetables and use metal utensils as you’ll enjoy the scratch resistant surface making it incredibly durable. 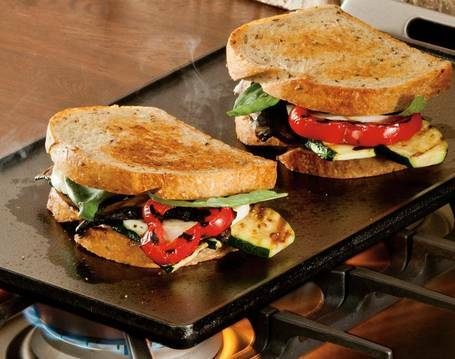 Most customers have gloated about cooking up to four sandwiches inside this stovetop griddle. The thick aluminum also allows food to brown evenly and nicely, so you don’t have that uneven cooking distribution. Fits on most cooking stoves and surfaces and doesn’t take up a whole lot of space, which is a plus. The Weight: The griddle weighs approximately four pounds, and like the review states above, it does a large and wide parameter space, which makes it a bit heavy for some customers preferences. Made In China: Certain customers didn’t like the idea of the product being made in China. They prefer their products made either in the U.S. or a country with tighter regulations in the manufacturing area. This is a personal preference that doesn’t affect the performance of the Emeril Lagasse Double Burner Griddle. Hot Handles: The riveted stainless steel double handles on this griddle do heat up quite obnoxiously. Some customers have complained about getting burnt from the touch.Be cautious or put on oven gloves before handling after cooking. For the price, the product’s manufacturer, you really can’t go wrong with this double stovetop griddle. It’s affordable, made with thick aluminum material to keep your griddle durable from scratching and wear. The two handles are convenient although they do get hot rapidly, so be careful there. All in all, this double burner griddle heats up nice, holds a lot of food with its size, and distributes heat evenly for a greatly cooked meal making it a griddle to recommend for your cooking use. The Lodge grill griddle is quite convenient since I can cook just anything with it. From roasting vegetables, preparing the barbecue, grilling my shrimp just to name a few. Features that I loved about the Lodge LDP3 reversible grill griddle. 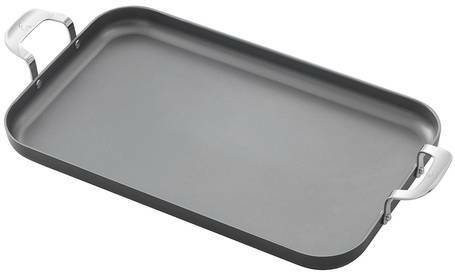 Flat surface: Although this stovetop griddle is excellent for preparing a variety of foods, I would not recommend for making greasy or food that require you to add water. This is because I found the surface to be too flat such that the grease from the cooking foods spills from the edges. On the positive side, the flat surface makes the grill griddle to be super convenient since you can prepare a variety of food at the same time. For example, I can cook my family some eggs, vegetables and a few steaks all on the same grill and at the same time too. The cooler center of the lodge griddle grill: A lot of people complain about the center of the griddle being colder than other parts of the grill, but I always view it as a benefit. Why? First of all, some foods don't require much heat when cooking like the eggs. Also, you may want to prepare your meals at a low temperature so they can have that crispy taste. So how about you use this section of the griddle to cook that kind of food? Versatile: Although the griddle is designed for use with a burner, stove or even a grill, use the device in the oven too. This is possible because the griddle is designed with a flat surface and non greasy surface that makes it easy to bake some snacks or roast a chicken. At home, we use the griddle to prepare scones or mini pizza with our oven. 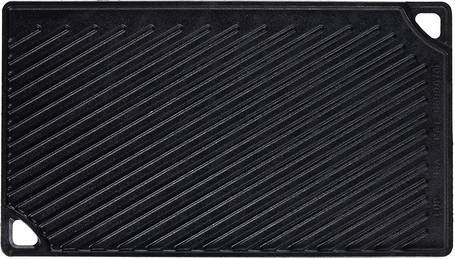 Advantages incorporated in this cast iron grill griddle: To be honest, I was hesitant to buy this griddle with the fear that my food will not be adequately turned. On the contrary, this grill is quite convenient when turning your food. I realized that the edges of the device are designed in a flat form so one can be able to slide in a spoon to turn the cooking food. Note that the food does not stick at all when cooking, I mean how convenient is that! This griddle is easy to clean and maintain its natural look since it is sold while pre-seasoned and this is the reason as to why the food does not stick on the device while cooking. I also rub some olive oil on the surface of the griddle to prevent non greasy food from sticking which is quite helpful. What to know before you buy the Lodge reversible grill griddle. For easy cleaning of this cast iron griddle grill, wash it immediately you remove the food from the fire before it cools so you can be able to remove any grease that may have dripped on the grill. The device is designed for use with two burners and can be used on outdoor grills, oven and other burners such as electric or stove burners. If you are searching for a high-quality durable, non-stick griddle; then look no further than the Calphalon Griddle. This griddle is backed by a lifetime warranty, which shows that this stovetop griddle, was built to last. The Calphalon square griddle is made of high quality materials like heavy gauge, hard-anodized aluminum and stainless steel. This allows for even heating and cooking every time. The stainless steel handle stays cool while cooking on the stove top and can withstand heat from the oven up to 450 degrees. The non-stick surface has three built-in extra layers, that make this a superior griddle. Two of the three layers are designed to provide optimal durability while the third layer ensures a non-stick cooking surface every time. You will fall in love with the ease of non-stick cooking and wonder how you lived without this practical stove stovetop griddle. There is also no need to spend any more hard earned money on cooking oil and non-stick sprays. Thats what the non-stick surface is for, simply preheat your pan and start cooking. Making sure to preheat the pan will ensure even cooking, as most non-stick pans take a little longer than others to heat up. Once you hear the pan, sear those steaks to perfection or grill the best grilled cheese. Great for hot sandwiches and omelettes! Ideal for all your cooking, especially pancakes, french toast and more! 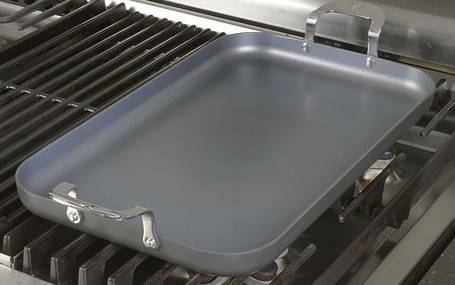 The versatility and functionality of this stove top griddle will draw you to it time and again. It will quickly become one of your favorite cooking items. Both oven and dishwasher safe this griddle will serve many purposes in your kitchen and allow you to make some if the best meals. Have a quesadilla night or enjoy a pile of fluffy pancakes for breakfast. 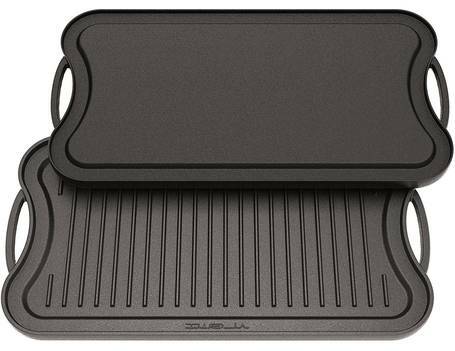 Whatever you decide to cook on the Calphalon Griddle will come out perfectly every time! The raised edges of this stove top griddle set it apart from the rest. It allows ease of flipping those flapjacks and catches any grease that would usually run off if a standard griddle, leaving you with a frustrating mess. Instead, this griddle keeps it all in and is virtually mess free. 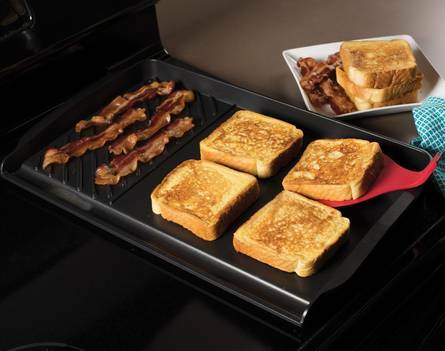 The sleek look and design will make this griddle a great addition to any kitchen. Its sure to become your go-to griddle for all of your cooking needs. Great for searing, grilling, and even more! You can pretty much cook anything on this square griddle and yeild great results every time. Say goodbye to the days of scouring pads and stuck on food. No one wants to spend time scrubbing stuck on food off of their pots and pans or let them soak just to go back and have to scrub some more. Non-stick cooking is definitely the way to go! More often than not you can simply wipe this non-stick griddle clean instead of having to do any scrubbing; or you can just put this griddle in the dishwasher and it will come out looking like new every time. Have you ever watched a Martha Stewart video of her cooking some delicious meals on a cast iron and immediately went online to hunt for one? 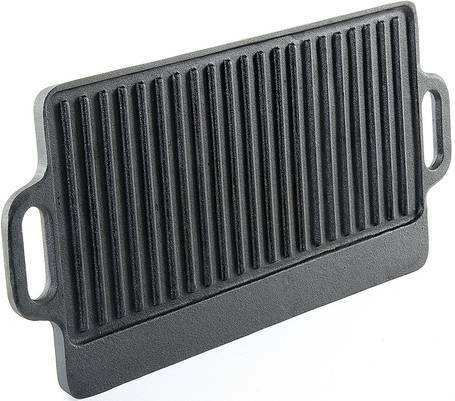 The ProSource hg-1101 griddle is a quality cast iron stove top griddle that can be used on most two burners, grills, or even over a campfire. This unit is made of solid cast iron that is highly durable and will last a long time. Furthermore, it can withstand high heat temperatures effortlessly. Aside from this, it has a grilling surface of 20’’ x 9’’ with a maximum weight of 8 pounds. These measurements not only make it portable but the surface is large enough to hold multiple bacon strips or larger steaks without your food having to dip into the grease trough. You’ll not only be able to grill your steak, chicken, lamb, etc., but you’ll also be able to cook pancakes, eggs, and so much more. How? Well, the ProScource 1101 is a 2-side reversible unit that is incredibly versatile; one side is ribbed while the other is smooth making it an ideal device to own for home use. Furthermore, the unit retains heat pretty well and distributes it evenly. You no longer have to worry about your steak coming out half cooked with the corners burnt to a crisp. The handles are not as smooth as you’d expect them to be, but nevertheless, they will not provide any discomfort to your hands. Moreover, this device covers a larger or smaller stove element making it ideal for anyone using a single burner or more. Modern cast irons are pretty easy to use. All you need to do is place your unit on your stove, let it heat up, and begin cooking. Add as many spices as your heart desires as cleaning it afterward is just as easy. However, do keep in mind that it might be a bit smaller than you’d expect. You might have to cook two rounds if you are planning to feed a larger family. Furthermore, it’s a handy device to carry along with you during your annual family outings. 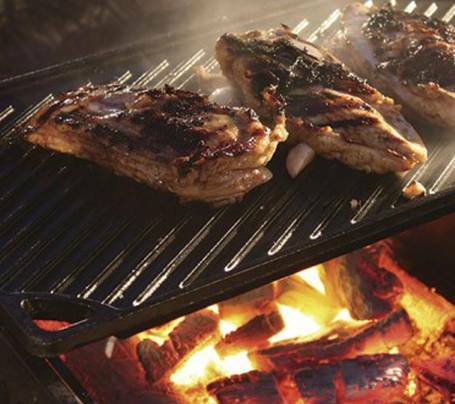 This model grills and cooks well over an open campfire. Since it retains heat for more extended periods of time, your food will be kept hot for longer durations - have a chat or help your little one with their homework without fear of getting back to cold food. ProSource 1101 can multi-cook - it can be used for grilling, steaming, or cooking. Just as everything you purchase, you always need to consider the overall performance and its relation to the pricing. From past customer reviews, it is clear that many customers are satisfied with this purchase. 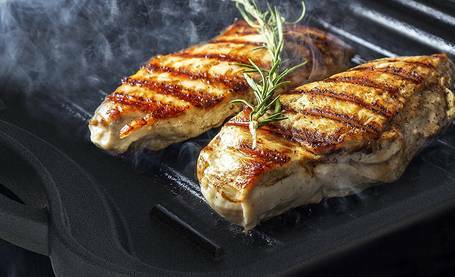 If you enjoy grilling food, then you’ll be pleased with your purchase as you can cook just about anything – from seafood as well as vegetables. This griddle stove top will give you great value for your money. It’s affordable, durable, user-friendly, and highly versatile. Having a family, means spending an ample amount of time in the kitchen. Cooking for a family of four, can be tough. 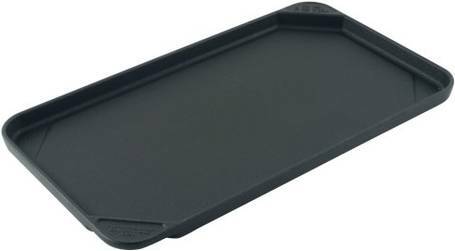 The Nordic Ware 2 Burner Griddle is great for making omelettes, hot sandwiches and pancakes. The smooth side of the griddle gives a huge amount of workspace to make meal time easier. The grill side of this stove top griddle grills the best home fries, bacon and sausage. Perfect for the rainy days, when you wish you could grill out. Throw some steaks on the grill side of this stovetop griddle and grill indoors. Make some fresh kabobs and grill them to perfection everytime. This griddle works great on both gas and electric stove tops. You can also use it directly on the grill. The non-stick surface allows for evenly seared meats and perfectly cooked meals every time. This stovetop griddle takes up the space of two burners, and gives you lots of room to work. Control the heat on your griddle to cook more than one different food at a time. 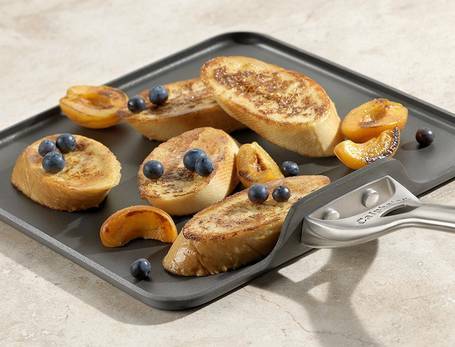 Cleanup is a breeze with this non stick griddle. Most times you can simply wipe it clean. For some of those harder jobs, you can throw the griddle in the dishwasher and it comes perfectly clean everytime. Cooking on some stove top griddles can be messy and frustrating. Oils spill over and leak down the side of the griddle and make a huge mess on your range top. This Nordic Ware grill griddle was definitely designed with that in mind. There is a backsplash, raised edge along the perimeter of the griddle with a reservoir in the front that acts as a grease trap. This helps keep your kitchen clean and also helps your meal be a little bit healthier without all of the excess grease. 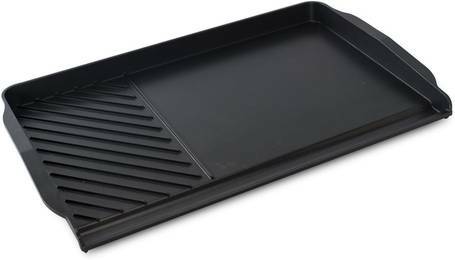 Make sure to note that this Nordic Ware griddle is not cast iron. It is instead made from durable cast aluminum. It may look like cast iron but it isn't. So don't overlook that feature before purchasing or you'll be disappointed. While cast iron has always been my favorite. My new Nordic Ware stovetop griddle has quickly become my new favorite! Unlike cast iron there is no pretreating this stovetop griddle. It's ready to use right out of the box. I can cook for the whole family without having to make food in batches. It's hard to keep food hot and fresh while waiting on the next batch to cook. I don't have to worry about that anymore. This huge surface provides me optimum space to make plenty of food to go around. It's great for the holidays too. When you have family staying and have to make a large breakfast or any meal for that matter it's usually very complicated. Not with this griddle. I don't know how I ever lived without it! Stovetop griddles are pieces of cooking equipment that is designed to make specific types of food. They can be used to make pancakes, steaks, sauteed dishes and for frying various foods. A stovetop griddle can have a smooth surface or one with ridges. This type of cooking appliance is typically placed on a stove top burner. The following information will provide you with some useful knowledge about griddles and the best way that you can utilize this cooking device. There are 3 basic types of griddles for stove tops. They include the double burner, the electric model and the single burner units. Each of these griddle types is best suited for different purposes. Here is a quick explanation of each kind. This type of griddle covers two burners on most stoves. It can be used on an electric or a gas model type and it can have handles. Some double burner models have legs that can raise the unit above the heat at various levels. The electric stovetop griddle model can have a double or single burner design. This type of cooking utensil works by being plugged into an outlet. Since electric models have their own power source, they do not need a stove to heat food. However, the unit is often placed over a stove top for more effective cooking. Also, some electric griddle models take up too much counter space and the stove is really the only place for them in the kitchen. We have some great buying guides to help you find the perfect product for you: Best Electric Griddle, Best Electric Skillet, Stainless Steel Electric Griddles, Large Electric Griddles, Commercial Electric Griddles and Ceramic Electric Griddles. This type of apparatus is used over one burner on a stove. They can have a round or square design. Like most cooking equipment and utensils, griddles have their own features. Most griddles have grip handles and they can also have a long single handle for grasping. The units are usually made out of a thick iron surface but many are made out of chrome steel, aluminum or stainless steel. A few units are made out of really durable clay material and stone. A lot of griddles have non-stick surfaces and they are covered with Teflon. The type of metal that is used in the construct will depend on manufacturer design. Cast iron is arguably the best griddle for the stove top. They are heavy duty, solid and can take the heat. They can also stand up to repeated use. While they might not have a non-stick surface, they can usually cook food without causing the substance to stick. Users can even add flavoring and seasoning to these types of griddles which can then bring out the best flavors for foods such as steaks, burgers or fried or grilled meats. The best stovetop griddle has two basic types of surfaces. One type is smooth and the other type has ridges. Smooth stovetop griddles are commonly used for food items such as pancakes, fried eggs, flat bread, sauteed vegetables and even for grilled cheese or fried bologna. A breakfast griddle is great for making these type of breakfast foods. Ridge griddles typically a have grated design that is commonly used to cook foods such as steak, chicken, pork, hamburger and another type of meats. By the way, people can get a barbecue type of flavor with some of the ridge griddles. While the meat will not have the charcoal or propane taste, it can still have that char boiled flavor. Many restaurants typically use griddles to provide this type of flavor for many dishes on their menu. Some griddles can have a smooth and ridge designed. This allows users to cook different types of foods at the same time. A griddle breakfast is best made by using this utensil. Manufacturers sometimes make griddles with knobs that come with knobs for heat control. Digital features are often included with electric griddle models. Once again, some units have legs or stands that can even be collapsible. They are used to control heat levels. Griddles with stands and legs are best suited for radiant electric stoves with glass tops. They help cooks to keep from scratching the surface. A griddle for stove top often have these extra features when they are specifically designed. It was already mentioned that griddles can stand up to heat and repeated. The more expensive a griddle is the longer it will last. This is typically a rule for all griddles. Keep in mind that a person who rarely cooks does not need a high end or large griddle. Of course, unless they just want to buy one to have a good cooking utensil at their disposal. So, a cheaper model will do just fine. However, if a family cooks or if people entertain a lot, then it will only make sense to get a high-end stovetop griddle product. The point is that a person should buy the type of griddle that will suite their cooking needs. Most stovetop griddles are priced between $15 and $400 and some units can even cost more. Once again, the material and design of the unit will determine its prices. Also, don’t forget that the more expensive and durable name brands will probably cost more. The average price for a decent stovetop griddle is between $40 and $70. A griddle can be used for just about any type of cooking except for boiling, broiling or baking foods. Griddles are very versatile and they ensure that cook can make some basic dishes in a unique way. You can use a griddle for a wide range of foods that can easily be prepared. To sum things up, stove top griddles provide cooks with a versatile and unique way to make food. They can be used to make lots of food all at once and they can help reduce energy use once the metal is heated up. Most stovetop griddles are durable and can be used for a wide range of foods. This unit is a great tool for making some common dishes and for creating unique foods as well. In closing, every good cook should have a griddle in their kitchen. If you want to read more, visit our Double Burner Griddle For Glass Top Stove buying guide for more options.